396 Beacon is located on the north side of Beacon, between Fairfield and Gloucester, with 380-388 Beacon to the east and 398 Beacon to the west. 396 Beacon was built ca. 1872 by Bourn & Leavitt, a partnership of carpenters Robert Tower Bourn (Bourne) and William Leavitt, one of seven houses (388-390-392-394-396-398-400 Beacon) built for George H. Peters and his partners in the firm of Edward D. Peters & Co., commission merchants, for speculative sale. The seven houses were built on the western 180 feet of a 200 foot lot George Peters purchased on March 1, 1872, from the Boston and Roxbury Mill Corporation. All seven houses were completed by 1874 and are shown on the 1874 Hopkins map. However, only 388 Beacon was sold immediately. 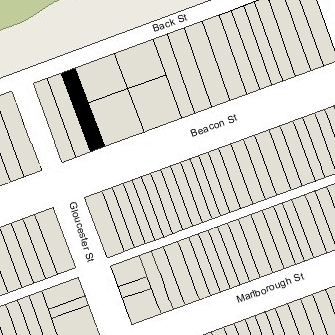 The remaining six houses at 390-400 Beacon were unsold, and possibly unoccupied, until 1877. Click here for an index to the deeds for 396 Beacon. On April 5, 1878, the New England Mutual Life Insurance Company foreclosed on its mortgage to George Peters and sold 396 Beacon to retired merchant Richard Perkins. He and his wife, Catherine P. (Dow) Perkins, lived at 146 Charles. On December 1, 1879, 396 Beacon was purchased from Richard Perkins by Maria Ann (Pratt) Smith, the wife of leather dealer Albert Oliver Smith. They previously had lived at 21 Allston Street. Her unmarried sister, Helen L. Pratt, lived with them. Albert Smith died in September of 1910. Maria Smith, their two sons, Albert Pratt Smith and Stanley Webster Smith, and her sister, Helen Pratt, continued to live at 396 Beacon. Maria Smith died in April of 1915; her sons and sister continued to live at 396 Beacon during the 1915-1916 winter season, but moved thereafter. Stanley Smith married in March of 1916 to Nora Kathleen Johnstone. In January of 1920, at the time of the US Census, Stanley and Nora Smith were living at 122 Bay State Road, and Helen Pratt and Albert Smith were living in Andover. 396 Beacon was not listed in the 1916 Blue Book. On September 11, 1916, 396 Beacon was purchased from Albert and Stanley Smith by real estate trustee Davenport Brown. He and his wife, Marie (McKenna) Brown, made it their home. They previously had lived in Medfield. They raised their only daughter, Marie Davenport Brown (born Marie McKenna Brown) there. By the 1926-1927 winter season, they were joined by Davenport Brown’s niece, Mary Clarissa Vance, the daughter of Reginald Conroy Vance and Clarissa (Brown) Vance. She previously had lived with her parents in Washington DC. Mary Vance and Marie Brown both were debutantes in 1928. Marie Brown married in January of 1930 to George Glover Crocker, III. After their marriage, they lived in Cohasset. Mary Vance continued to live at 396 Beacon until her cousin’s marriage, but moved thereafter. She married in September of 1934 to Basil Livingston Macassey of London. 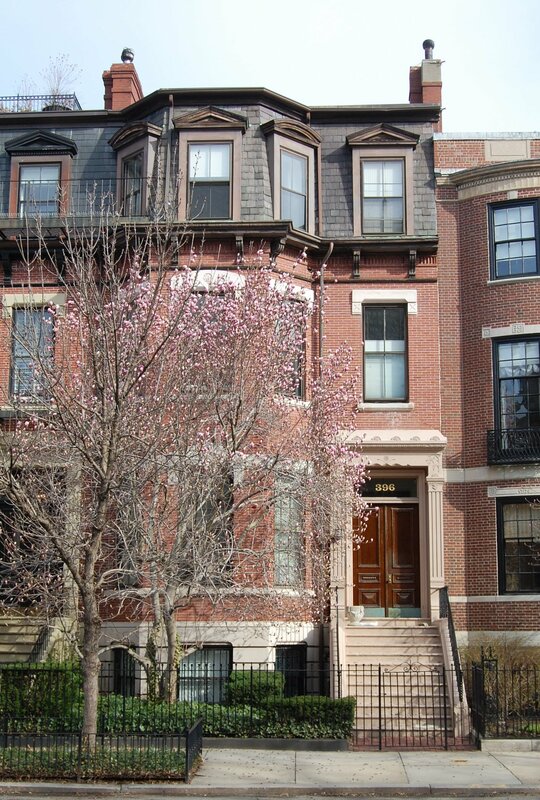 The Browns continued to live at 396 Beacon until about 1943, but had moved to 81 Beacon by 1944. By 1944, 396 Beacon had become the home of the Browns’ son-in-law and daughter, George and Marie (Brown) Crocker. He was a manufacturer and former banker. They previously had lived at 327 Beacon. They continued to live at 396 Beacon until about 1952. On May 6, 1952, 396 Beacon was purchased from Davenport Brown by the Weston Construction Company (Francis J. Callahan, president, and Thomas J. Diab, treasurer). The property changed hands and on December 1, 1952, was acquired by Lawrence Clarke Hill, a salesman, as trustee on his own behalf and for the benefit of his wife, Emilie (Parrock) Hill. In February of 1953, he filed for (and subsequently received) permission to convert the property from a single-family dwelling into five apartments. He abandoned the permit and, in April of 1953, filed for (and subsequently received) permission to convert the property into six units. It appears that he actually converted the property into seven units. The remodeling was designed by architect Leon L. Furr. After it was remodeled, the Hills lived in one of the units. They previously had lived in Brookline. Emilie Hill died in April of 1965, and in February of 1968 Lawrence Hill married again, to Barbara Ruggles (Ferguson) Lincoln, the widow of John Mason Lincoln. After their marriage, they lived at 396 Beacon and later in Florida. On December 11, 1979, 396 Beacon was purchased from Lawrence Hill by Steven A. DiSarro, trustee of the 396 Beacon Trust. 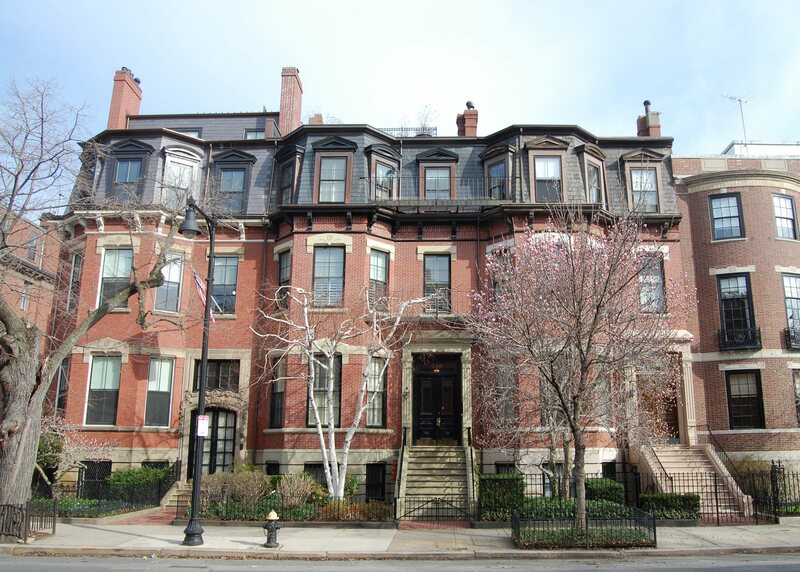 On February 18, 1981, he converted the property into seven condominium units, the 396 Beacon Street Condominium. In July of 2004, the owner of the unit on the garden level, applied for (and subsequently received) permission to legalize the building as having seven (rather than six) units.